FIIs bought heavily on 31 may 11...1310 Cr net in equities....1100 Cr in index futures and 400 Cr in stock futures.. The following is combined FII trading data across NSE and BSE collated on the basis of trades executed by FIIs on 31-May-2011. The following is combined Domestic Institutional Investors trading data across NSE and BSE collated on the basis of trades executed by Banks, DFIs, Insurance, MFs and New Pension System on 31-May-2011. 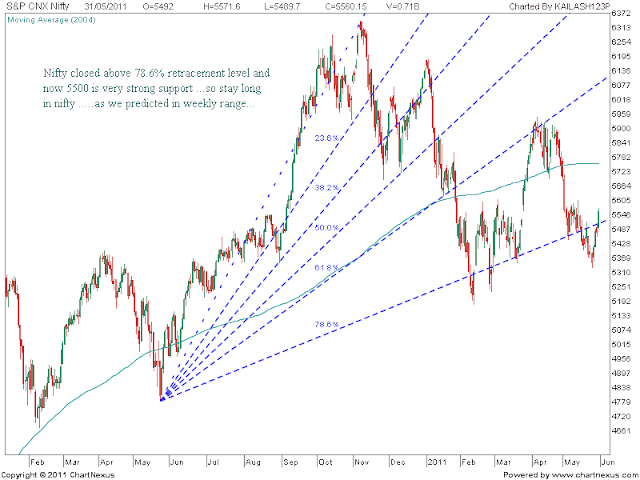 Nifty analysed daily chart 31 May ...Bulls are really Bulls . 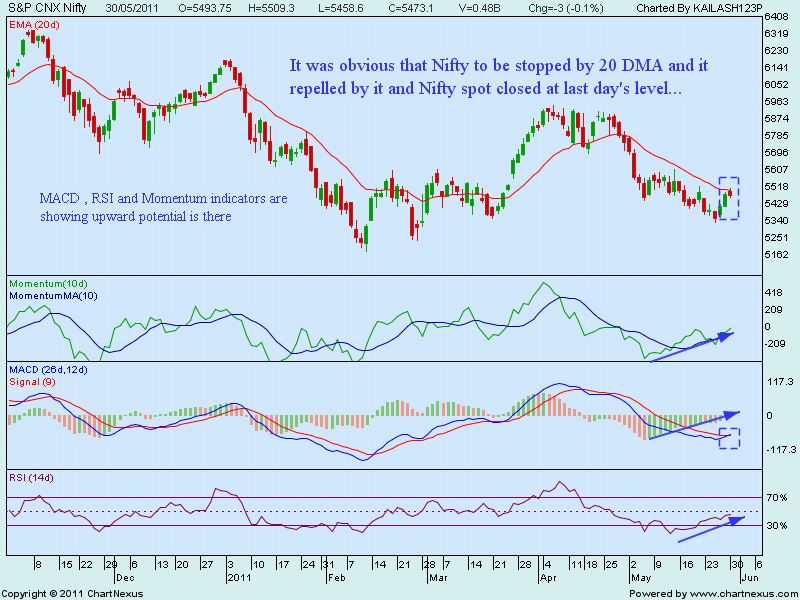 In morning when every one was bear on expiry... we wrote for close above 5400 .. Please read instructions here before placing your trade order . Flat to positive opening is expected with volatility ahead with stock specific moves. Value buying started in market ..deception and dodging too under progress.. nice stocks are available at attractive rates .charts are ok...showing strength ...possibility of range trades may be at higher levels . Detailed analysis and positional calls are available for paid members at http://tipsncalls.blogspot.com/ . 80000/- plus gained so for on our positional call..have a look please . FIIs were net buyers in equities and thin volumes in F&O. FIIs and DIIs activity ...FIIs were net buyers in equities and thin volumes in F&O. The following is combined FII trading data across NSE and BSE collated on the basis of trades executed by FIIs on 30-May-2011. The following is combined Domestic Institutional Investors trading data across NSE and BSE collated on the basis of trades executed by Banks, DFIs, Insurance, MFs and New Pension System on 30-May-2011. Daily nifty chart is showing that bulls are still in power .. Almost flat opening is expected with volatility ahead . 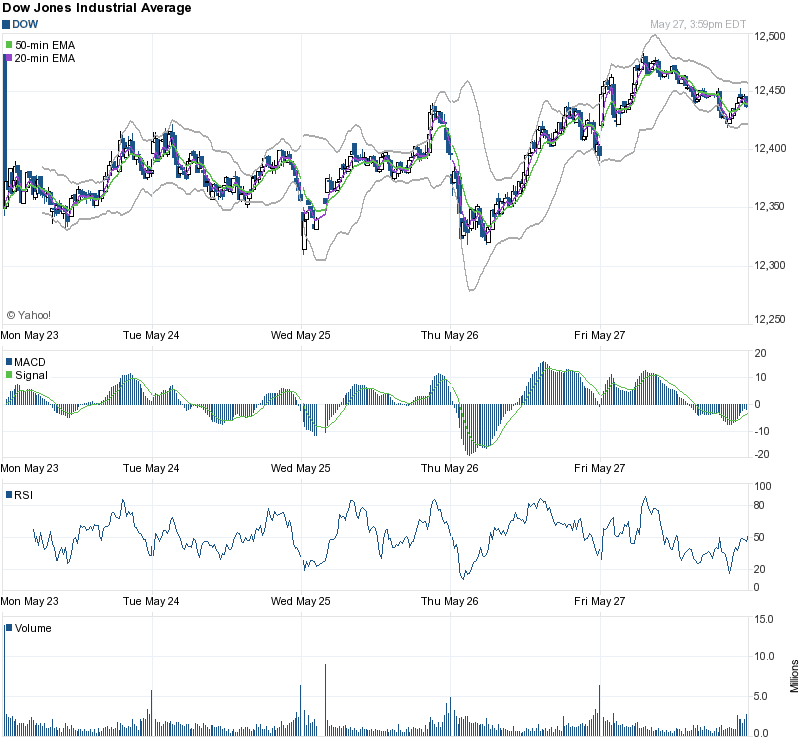 Expecting stock specific moves. Value buying started in market ..deception and dodging too under progress.. nice stocks are available at attractive rates .Why they are advising / forcing small traders to exit from the stock my doubt is if every one is selling then who is buying / accumulating it , propaganda is on for Nifty that it will trade at 5000 in this week...God knows who is behind this...charts are ok...showing strength ...possibility of range trades may be there but steep fall to 5k .....noooooooooooooooooooooooooooo. You can post your stock queries there for early reply . kailash Chaturvedi (5/27/2011 2:35:37 PM): u bought it at day before yestday na ? Now it is on winning streak and its 5 day's chart is indicating that after a fall it was traded in range m Dow heading towards north east direction..possibility 12600 ++ .go long with 12380 stop loss closing basis ..